Evening view of Pittsburgh from the top of the Duquesne Incline in Mount Washington, Pittsburgh, Pennsylvania. With Pittsburgh’s outstanding attractions, award-winning restaurants, and world-class accommodations it makes for a great reunion town. Pittsburgh is also the City of Champions; there’s no better place to visit if you’re a sports fan. 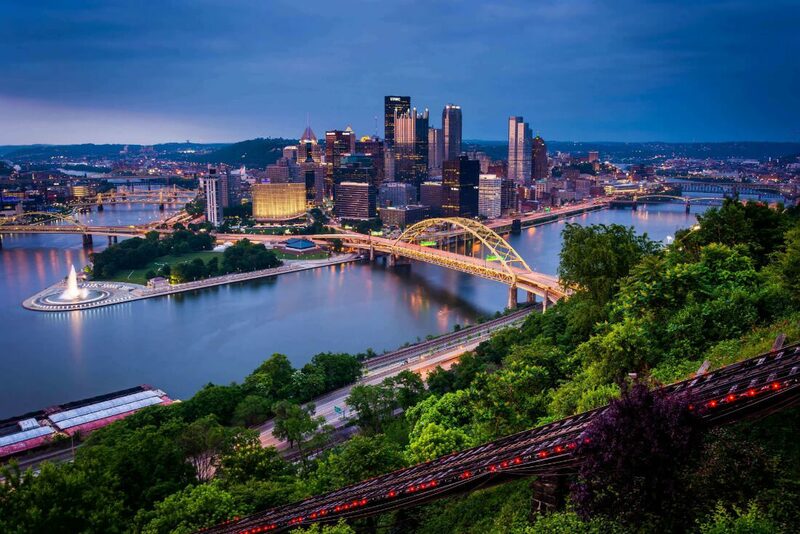 Go back in time and experience five billion years of the Earth’s history and 250+ years of Pittsburgh’s history at such locations as Carnegie Museum of Natural History, Fort Pitt Museum and the Senator John Heinz History Center. Enjoy a spectacular panorama of Pittsburgh and its three rivers with a ride on the 140-year-old Incline car to the Observation Deck for what USA Today Weekend Magazine calls one of the “10 most beautiful views in America”. And there is no better way to see this city than aboard a Gateway Clipper Riverboat.